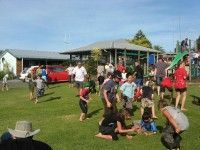 There is plenty of entertainment on offer here at OMOKOROA THERMAL HOLIDAY PARK! Enjoy a game of pool in our Games Room, where you will find a 29-inch colour TV and a ‘mini-grandstand’- perfect for watching movies or a big game! We have a small library of books for you to enjoy in the Games Room, and some great card games and board games are available at the office. Grab a few families together and have a fun game of cricket in the park grounds – we have cricket and other sports gear (including petanque equipment) at the office. The children’s playground is situated adjacent to the main amenities block, and within sight of most accommodations. You can supervise children while they play on slides, climbing walls, ropes, jungle gym bars and more.